A new selection mode using projection – much like the mesh Knife tool does. 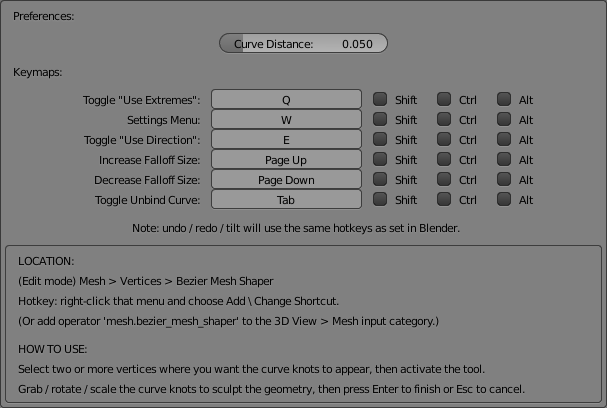 This way you can precisely select where you want the curve to start from, you just navigate your view and click to set the knots, then press Enter to start deforming. For technical reasons this is not yet available on meshes with shape keys. Knot radius support – being able to shrink and expand the mesh – so now we support three knot attributes: position, tilt and radius. Being able to unbind and modify the curve, so you can move it around, add or remove knots etc., then continue deforming from there. This is done with a new shortcut key for toggling this mode, please see the add-on preferences. Initial support for shape keys. In some cases the curve might look as if flying off in the distance, but at least it’s manipulating the shape key right. Increased numerical precision (better curve mapping algorithm). The code is 84% larger, lots of new lines. I’m also going to make a cheatsheet-type image with all you can do with this tool, since there’s no documentation. But Radius ?? how it’s work ? what the hokey ? Ctrl + T to set the knot tilt (“rotation”) – the Use Direction option of the tool is what toggles this effect on and off. Alt + T to clear tilt. Alt + S to set the knot radius (“scale”). V key to bring up the Set Bézier Handle Type menu, this lets you set how the knot handles behave (useful types are Aligned, Vector and Free). The center point of each knot needs to be selected for this to make a change (selecting the handles makes no difference). You can practice these things with a random curve. You can create one with Shift + A > Curve > Bézier, go to its Edit mode and try those actions. You can edit some of these values on the Properties (N) panel as well. This is going great! Awesome work! Are you on Twitter? Holy cow this looks even more amazing than before! Great update! Maybe even a video tutorial ? If you cant maybe ask one of your fans ? Currently, it seems impossible to rotate view with Alt+LMB. Is this something you might consider adding as a modal option? Thank you everyone, really appreciated! That means a lot to me MACHIN3, thank you. I’m afraid I’m not on Twitter… for now I’m relying on the good-ol’ word of mouth lol. I think a cheatsheet image explaining all that you can do with the tool will satisfy that, and the GIFs can show the what tool can do (they’re like tiny snippets of a video, right?). Hi. Could you please explain more how you’re set up? If I go to Blender 2.79 and turn on “Emulate 3-button mouse” in the user prefs., I can orbit the camera with Middle-click-drag or Alt + Left-click-drag, during that “projection” mode where the cursor becomes a circle. I’m not who you are replying to but I use Alt + LMB to rotate my view (standard Maya controls - Alt + LMB/MMB/RMB to rotate, pan, zoom). It does appear that you can’t rotate the camera while in curve-creation mode, so maybe that’s what they meant? I’m not who you are replying to but I use Alt + LMB to rotate my view (standard Maya controls - Alt + LMB/MMB/RMB to rotate, pan, zoom). Thanks for the info @Dheim, it helped. I found out what the problem was and submitted an update email. It works wonderfully now, thank you! I tested it on a sphere and was able to rotate around it while creating my projection bezier. Really loving the projection bezier as well - great addition to the tool. One thing I noticed that felt like a bug (but maybe that’s just my ignorance) is that if I change the radius of a knot I don’t see any immediate change, but if I Tab in and out of Unbound mode the mesh will change every time I go in and out, ultimately warping my mesh. having right click alternatively apply or double lmb or something other than spacebar would be the shiznit. is it possible to do a mask mode (or select), to use a strong Fall Off without distorting the reste ? this would be very useful for 2D animation. Is it possible to potentially crease a heavy model using this tool by attracting nearby edge loops around the bezier curve? @Dheim interesting bug, I changed it so that when you unbind the curve, the tilts and radii of all knots are reset (else they get applied over and over like that). Thanks for the gif. @masterxeon1001 I re-added the spacebar as a way to apply, and I can send you a mod version that lets you use rightclick or double-left click for that, if you’d like? It’s simple to add. @Kouza_Nagi I apologize because this is due to lack of documentation: you can mask vertices by hiding them in mesh Edit mode. You can select some vertices, press H to hide them, then select other vertices and start the tool as normal. Hidden vertices will be ignored. So H is the default Blender shortcut for hiding. There’s also Shift + H to hide unselected vertices, and Alt + H to unhide everything. But note that the vertices beyond the two knots get attracted to the knots themselves, rather than attracted to what the rest of the “infinite” curve would be. I think this is something that I’d like as well as it’s consistent with some tools that I use. Also I noticed that if it’s possible to create a curve without kink in new selection mode, similar to a pen tool in illustrator. In illustrator, you create a bezier curve, and continue to do so with holding and dragging rather than clicking. Clicking will create hard vertices whereas holding click for a second will switch to curve mode. a big request. Could we get a curve without handles but with path dots? I would kill for that.